REGISTER NOW FOR AIA SUMMER CAMP 2019! 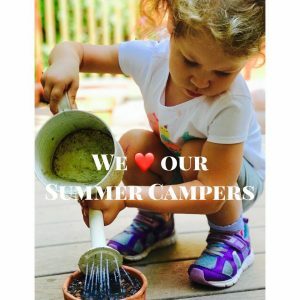 AIA Montessori offers a variety of camps to keep your kids busy this summer. Camp hours are from 9:00am – 1:00 pm. and are geared toward children 18 months through 6 years. (18-months-24 months can only stay for 8 hours/week – call for more info). Children ages 5-12 may register for our vendor camps (see below). Children should bring a lunch for all AIA camps. Morning snacks are provided. Optional pizza lunch will be available on Fridays. Students currently enrolled at AIA Montessori will be given priority and may pay either by check or via FACTS May payment. Students not enrolled at AIA Montessori are encouraged to schedule a brief tour of the school where you will be given registration information. Session 1 – June 3-7 “The Little Gardener” with Mrs. Cook We will plant a garden that will be cared for over the summer by the campers. Fridays are splash days – children arrive in their bathing suits with a change of clothes as we splash, pour and have fun with water! “The Little Gardener” with Mrs. Cook We will plant a garden that will be cared for over the summer by the campers. “The Five Senses” with Mrs. Cook We will become aware of ourselves as we discover the world through our 5 senses. “The Zoo Keeper” with Mrs. Cook We will learn about the different animals and sing songs about zoo animals. Fridays are splash days – children arrive in their bathing suits with a change of clothes as we splash, pour and have fun with water! “The Little Harvester” with Mrs. Cook We will harvest our garden that we planted at the beginning of the summer and learn about how plants grow. Session 7 – July 22-26 “The Little Harvester” with Mrs. Cook We will harvest our garden that we planted at the beginning of the summer and learn about how plants grow. Fridays are splash days – children arrive in their bathing suits with a change of clothes as we splash, pour and have fun with water! Session 1 – June 3-7 “Let’s Get Cooking” with Mrs. Alfred Campers will become mini chefs as we explore math, language, science and nutrition through cooking and crafts. Allergy notice: We will be working with milk, flour, nuts and eggs. “Around The World” with Mrs. Alfred On what continent would you find a koala bear? Is it hot in Antarctica? We will be talking about the continents and learning something special about each one. Exploring animals, climate and food around the world. “Let’s Get our Hands on Science” with Mrs. Alfred Science is fun when you get your hands on it . . . or in it, for that “matter”. We will make slime, work with oil and water, and other amazing things. “Games, Games, Games” with Mrs. Phillips So much can be gained from playing games! Campers will learn and practice skills (such as manners, sportsmanship, taking turns, listening, working with a partner, and coordination) by playing board games, card games and other fun activities. There will be individual games as well as group games. “Vamonos a la Selva Tropical (Let’s go to the Rainforest)” with Mrs. Perdomo Delve deep into the exotic habitat of the rainforest. Explore the diverse flora and fauna as we draw, paint and learn this fascinating biosphere. “Science Camp” with Mrs. Suresh Many families know Mrs. Suresh as our Upper Elementary teacher. She is also a fun loving certified primary teacher. Mrs. Suresh’s recipe for science camp – take a little chemistry, add a touch of physics, throw in a splash of color, and have some fun at the science camp. Our very own Director, Mrs. Fultz, will work with the children to discover the wonders of the world around them.